Jerry Permenter will host holiday-themed storytelling sessions from 1 to 4 p.m. Saturday and Sunday, Dec. 15 and 16, at Cole Art Center. A limited number of his "Red Dirt Memories" book will be available for purchase. NACOGDOCHES, Texas - Another installment of the popular "Red Dirt Memories: Storytelling with Jerry Permenter" is planned for 1 to 4 p.m. Saturday and Sunday, Dec. 15 and 16, at The Cole Art Center @ The Old Opera House in downtown Nacogdoches. Permenter's newly published book, "Red Dirt Memories," will be available for purchase. A native of the Swift community in Nacogdoches County, Permenter, who goes by the name Red DirtBoy on Facebook, grew up in rural East Texas, and his memories of those early years laid the groundwork for what is now the Facebook page Red Dirt Memories, which has more than 10,000 followers. 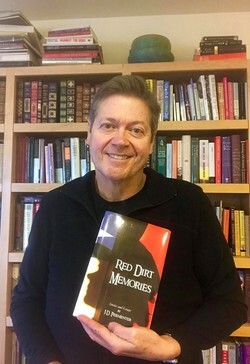 SFA Press is publishing "Red Dirt Memories," and a limited number will be available for purchase and for Permenter to sign at the Christmas edition of storytelling at Cole Art Center. Books are $20 each; cash or check only will be accepted. Permenter will again share some of his own "red dirt" memories in holiday-themed storytelling sessions both afternoons. Admission is free, but seating in Cole Art Center is limited, according to Lisa Steed, events coordinator for SFA art galleries. Among Permenter's topics: Dog Trot House, Funeralizing, Cotton Dresses and more. Similar storytelling sessions last May at Cole Art Center drew large crowds of enthusiastic Red Dirt Memories followers, Steed said. "I've been tremendously blessed by growing up in Nacogdoches and, in many ways, I hope to give back to my hometown at this stage of my life," Permenter said in a previous press release. "By offering readings, my writings and sharing our collective memories, I think many will enjoy the nostalgia of these stories and find it a great way to spend a weekend afternoon." Exhibitions showing in Cole Art Center through the end of this year include SFA's Biennial Juried Art Metals and Jewelry exhibition, "Kymia Nawabi: Not For Long, My Forlorn" and a vintage Christmas decoration, ornament and toy display.